Toyota is pulling out of a production plant in the US it jointly owns with General Motors (GM), the first time it has abandoned a factory. 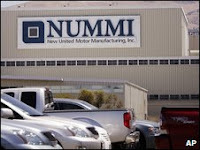 The world's largest carmaker will stop production at the Fremont, California-based New United Motor Manufacturing plant in March 2010. GM announced earlier this year that it would withdraw from the venture. Toyota said: "Over the mid to long-term, it just would not be economically viable to continue production." The firm will move production to its other plants in the US and in Japan. "This is most unfortunate and we deeply regret having to take this action," the carmaker said. California Governor Arnold Schwarzenegger said: "Today is a sad day in the history of Fremont as California joins the ranks of states adversely affected by the worldwide collapse in demand for automobiles." Earlier this week, Toyota announced plans to suspend production for more than a year at one of its plants in Japan - another first for the company. It also confirmed it was considering suspending one of its production lines at Burnaston in Derbyshire in the UK, but said that no decision had been taken. Toyota has reported operating losses for the past three quarters as recessions around the world have hit demand for its vehicles.